An easy and versatile solution for most cladding projects. Trespa Pura NFC® Sidings are an attractive and durable cladding solution that is incredibly low maintenance; there is no required pre-finishing, refinishing or repainting necessary during the lifetime of the siding. 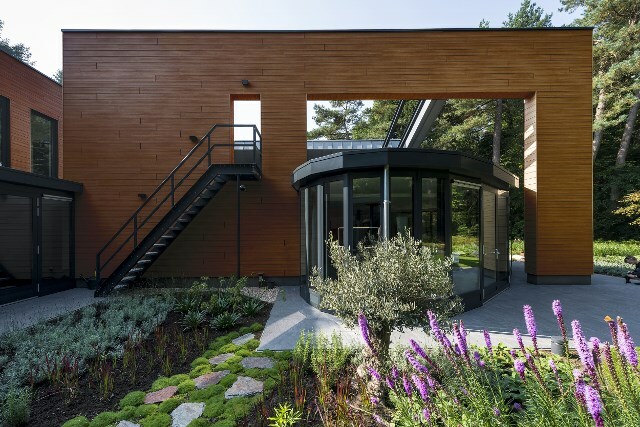 Looking for a green cladding solution? Trespa Pura Sidings are made from up to 70% natural fibers, which are sourced from sustainable forests and certified according to the PECF™ standard. For maximum design freedom, Trespa Pura boards can be installed vertically or horizontally and there is a stunning range of colors to complement any design. 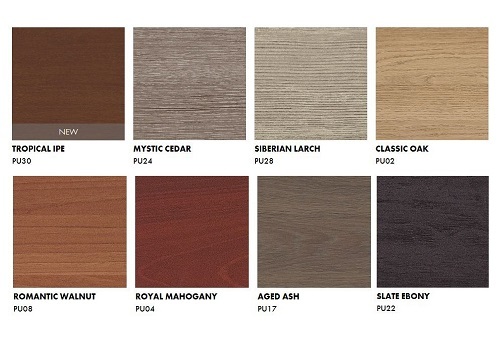 Choose from eight Wood Decor tones that offer the look of real wood with consistent graining and color or eight rich solid shades from the Uni Colour collection. Find out more below about this versatile facade solution, or follow the links to our affiliate website, MataverdeDecking.com for a wealth of Trespa information, videos and photos. No need to cut or router, the planks are ready to use. Installed quickly with no mess and no fuss. High scratch and impact resistance guarantees hassle-free installation and a beautiful end result. Performs exceptionally well outdoors and will stay attractive for many years. Sun and rain have no significant effect on the planks surface. The closed surface of Trespa Pura NFC® results in little build-up of dirt. Minimal maintenance is required, it is easy to clean, and painting will not be required in the future. 10 year guarantee on product performance and color stability provided by General Woodcraft. When designing your Trespa Pura facade, choose from many handsome colors, including eight rich natural wood tones such as new Tropical Ipe. More about Trespa Pura colors here. Business Hours: Monday through Friday, 8:00 am to 5:00 pm EST. Closed weekends and holidays. © 2019 General Woodcraft, Inc. All Rights Reserved.